When it comes to birthday gifts, I try really hard to pick something the person would love. Typically I make most of the gifts I give. I have an adorable neighbor who just had a birthday party this past weekend. It is always so much fun making gifts for her birthday. This year I settled on this adorable pony blanket. Each of the squares are color coordinated to the pony. 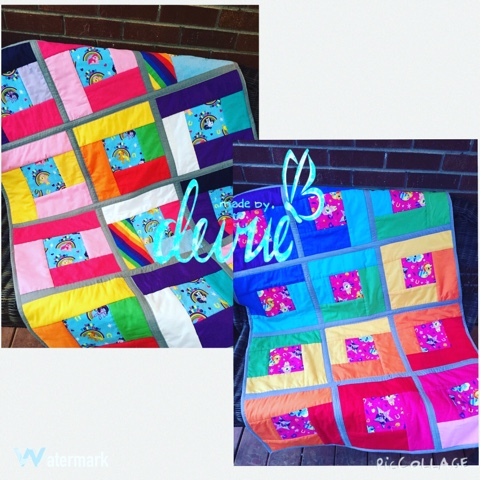 I love them all, but I must admit the Rainbow dash square is my favorite. This quilt was made with the quilt as you go method. I have fallen in love with it. It takes time cutting all the squares and batting, but the technique quilts the top to the bottom with each seam you sew. Once the square is done you can attach them with a top and bottom binding. The outside binding is done as normal! That's it! No fumbling with the quilt and free motion stitches (which I am no good at). 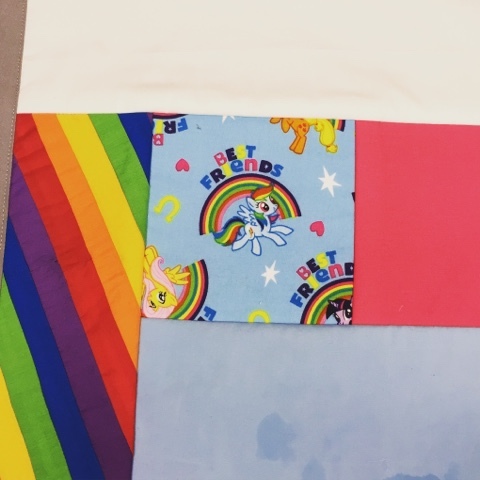 The rainbow side was made by sewing strips together and then I cut the square so they slant at and angle. I LOVE the way it turned out.